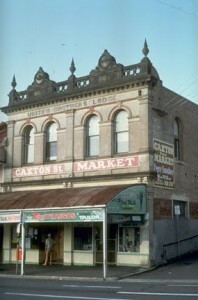 The Caxton Street Jazz Band was formed in Brisbane in 1977 by clarinettist Andy Jenner and commenced playing in the Baroona Hall in Caxton Street (see recent photo right). Naturally enough the personnel has changed a number of times over the years, although five of the current 6 members have been together since 2001. This recent continuity of players has contributed to the band’s reputation for being “tight and hot”. The band rose to prominence in the 80s thanks to its 11 year stint at the Jazz ‘n Jug sessions at the Caxton Hotel. These commenced in March ’81 and continued every Saturday until 1992 when the band split, although Bob Mair (drums) and Bernice Haydock (piano) took over the band name from that time. The band’s premier years in the 80s were probably 1981-4, when it became well-rehearsed, and popular with its repertoire of a blend of serious jazz and novelty numbers (the band played a total of 183 gigs in the year July 1981 to June 1982!). In the mid-80s, some of the longer term members left and were replaced by others who in turn moved on after a few years. The band then enjoyed stability in its lineup into the early 90s, but then a variety of players were used to make up the numbers into 1992. During the 90s the CSJB played mostly as a four piece, with firstly Col Wharton and then Bill Croft on reeds, and Chris Schnack on bass, until 1999 when the foundations of the current line-up were laid when trumpeter John Braben joined the band (John previously had a stint in the late 80s/early 90s). The band’s development as a hot 6-piece outfit were delayed when John moved to England for two years. During this period it played as a 5-piece, with Bill Croft, Tom Nicolson on trombone, Chris Schnack, and Bernice and Bob. By the time John returned from the UK in 2001, Paul Williams had replaced Bill Croft, and the band as it is today took shape. The only change in line-up since that time has been the bass player, with Chris Schnack, Matt Eves, Dennis Ashton, and now Andrew Shaw who joined in 2011 filling the bill.